Mediterranean cruise line MSC Cruises are excited to introduce to the world their latest, beautiful ship; MSC Seaview. Having been built at Fincantieri’s ship yard in Monfalcone, Italy, the traditional delivery ceremony will take place on Monday 4th June, before she traverses the Italian coastline en route to Genoa. It’s here that the glamourous Christening ceremony will take place on the 9th of June. MSC Seaview will then embark on an inaugural season in some wonderful Mediterranean destinations, including Naples, Valetta, and Barcelona, before spending the winter season in South America. Cruisers will have the option of embarking on the fabulous 19 night Grand Voyage, which begins in Barcelona and ends in Sao Paulo, Brazil, taking in ports including Lisbon, Salvador, and Rio de Janeiro along the way. Sister to MSC Seaside, this ship has also been built with an exceptional focus on the sea. The design blurs lines between in and outside, with passengers enjoying views of the surrounding ocean at almost every turn. 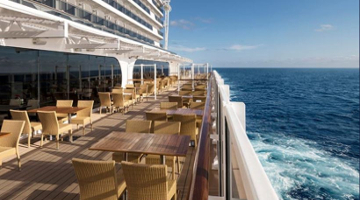 Deck 7 in particular offers a fabulous promenade area in which guests can swim, sunbathe, shop, and dine. There are also panoramic elevators onboard, as well glass-floored walks. Discover upcoming MSC Seaview cruise holidays, to see which venture suits you.